Wooden treasure chests are a wonderful project that can range from small to large, depending on how much treasure you have amassed. Here’s how to build a basic wooden treasure chest. Youngsters can also do this project, with adult supervision. The finished chest will be a rectangular box, 3 feet long and 12 inches tall. Select the wood you would like to use. Pine is the least expensive, and both sands and stains well. For extra character and to make your treasure chest look “well used,” look for boards with lots of grain and knot holes. The boards you buy will be standard 12-inch wide, 1-inch thick. Two 8 foot long boards are suggested to keep wood waste to a minimum. Cut four boards each 36 inches in length. Cut two square end boards, measuring 12 inches on each side. Sand each board’s edges to smooth and remove any rough cut edges so the board will sit flush against another board. Sand each of the boards first with the coarse grade sand paper to remove any roughness, and then with fine sandpaper for a smoother finish. If you want your treasure chest to look worn and scuffed, sand against and across the grain. Attach both square end boards. Take one long board and both square end boards, and nail the squares to the edge of the long board. Before nailing, check to make sure that the edges are flush. Nail the two other long boards to the square end boards. You should now have a three-sided box. Secure the long boards to each other using two to three nails evenly spaced along the length of the board. 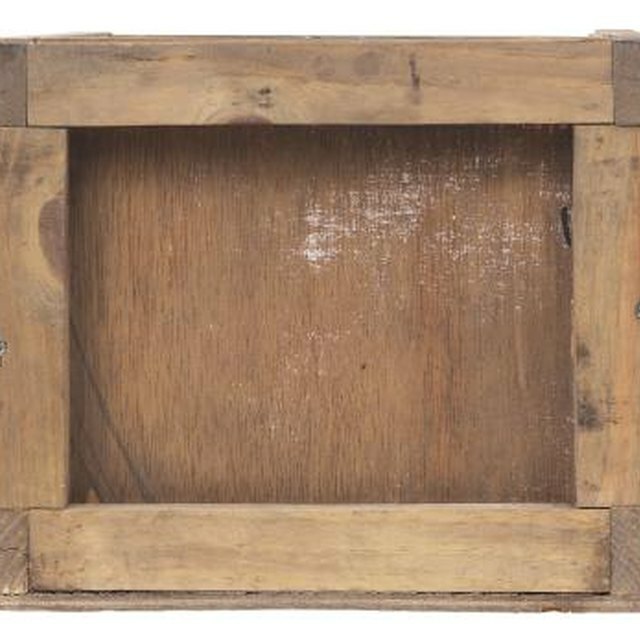 Place the last long board, which is the lid of the chest, on top of the box, and position until it is flush with all edges. Take one hinge and place it 12 inches from the left edge and nail or screw it in place on the top and side boards. Do the same with the second hinge, placing it 12 inches from the right edge. Check to see that the lid opens and closes freely. Adjust hinges as needed. Position the antique brass box corners, one at each corner of the lid. This creates a “reinforced” look that is common to good treasure chests. Rough up the box. Using the hammer, rasp and coarse sandpaper, add dents, dings and scrapes to your box, giving it the well-worn look. Note that these scrapes will stain darker than the rest of the wood. Stain the chest (optional). Using a dark stain, lightly brush on the stain on the wood, both inside and out. The longer you leave it on, the darker the color will be. Wipe off with a rag, and repeat until you achieve the desired color.